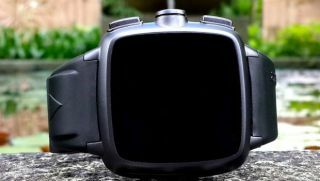 A new smartwatch that can make calls, send texts, access web content and do GPS navigation, independently of a smartphone, has achieved its modest Kickstarter funding goal. The Omate TrueSmart, which is more watchphone than smartwatch, reached its $100,000 (about £64,000, AU$111,000) funding goal in one day and is now sitting pretty at $202,643 (about $130,000, AU$225,000) with 28 days remaining. It's easy to see why it's proved popular. As well as the cellular and 3G tech, the Truesmart has a built in 5-megapixel camera, 4GB of internal storage, a dual-core 1.3GHz processor and 4GB of internal storage. The IP67 water-resistant (suitable for swimming) device boasts has a 1.5-inch touchscreen, runs Android 4.2 Jelly Bean and can also be controlled via gestures and voice. The TrueSmart, which can be secured from $179 (around £115, AU$199), is also being touted as a companion device for smartphones thanks to the Bluetooth and Wi-Fi connectivity. With so much cash in the bank so early the device is now - barring any of the Kickstarter horror stories of recent months - guaranteed to go into production. It's the second high profile smartwatch to get its start on the popular crowdsourcing site. The now-on-sale Pebble earned an astonishing $10 million from backers who believed in the project. With such a positive response in 24 hours, New York-based, South Korean company could be in line for a similar windfall. The TrueSmart's arrival also arrives at a pivotal time for the wearable devices with Samsung primed to launch its rumoured Galaxy Gear watch at its Unpacked Event on Sept. 4. Apple is also thought to be preparing an iWatch to complement iOS devices, although it seems less likely to see the light of day before 2013 is out.